Thousands of dead fish have been found following the suspected pollution of a river in Lincolnshire. The fish - dead or gasping for air - were spotted on Sunday in the River Witham between Kirkstead Bridge and Bardney Bridge, near Woodhall Spa. The Environment Agency (EA) said it was a "very serious" case. It said officers would be working to trace the source of pollution and would take any appropriate enforcement action once the source was identified. The EA said the water contained high levels of ammonia. Yvonne Daly, from the EA, said: "The scale is very significant, it is very serious pollution of the river and we do not see this on a regular basis. "There are thousands of fish which have been killed. This is really serious pollution. "We will be looking to find who has caused this and will take the relevant enforcement action against them." 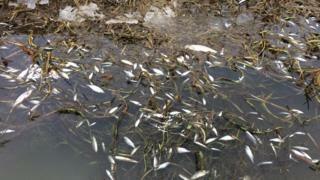 Reports of dead fish have also been received from the Boston area, some 20 miles (32 km) away, it added. CJ Foran, from Coningsby, said he had never seen anything like it. "There was a mix of different fish that were gasping and swimming upside down that weren't dead yet. "It just leaves you speechless to see that amount of dead fish just floating down the river." Andrew Walker, from Woodhall Spa, said there were thousands of dead fish in the river and residents wanted answers. "We need to know what it is and something needs to be done very urgently."